Mr. James Cashman, Jr. is one of the foremost people responsible for Las Vegas blossoming into one of the world’s most exciting golf destinations. 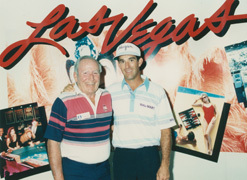 In the early 1980s, Cashman, Jr, worked very closely with fellow Las Vegas Golf Hall of Fame member Jim Colbert to help bring the PGA Tour back to Las Vegas for the first time in many years. In 1983, Cashman, Jr, Colbert, and the Las Vegas Founders Club, a group Cashman helped form, created the Panasonic Las Vegas Pro-Celebrity Classic, and it was the first PGA Tour event in history to boast a total purse of more than $1 million. A stellar field of professionals played in the first event, and the worldwide exposure the event generated helped display that Las Vegas was a place that could become a quality golf destination. “In the early days, when it took strong character to get people involved, Jim was always willing to take on those duties and use his considerable influence to get things done,” said Tom Hartley, another original member of the Las Vegas Founders Club.